It was back to school at the beginning of the month to start year 11 and to begin preparing for my GCSEs next summer. There were no competitions in the first half of the month so my first trip out was without Aslan, just me and Dad, and the opportunity to visit the Le Mileux Dressage National Championships at Stonleigh Park. It’s also the venue and occasion of the KBIS Para Gold Championships which I hope to be riding at next year. This time though my visit was by invitation of the British Dressage Supporters Club to receive my certificate as recognition of representing Great Britain in July. This was an absolute honour for me and something I am really really proud of. 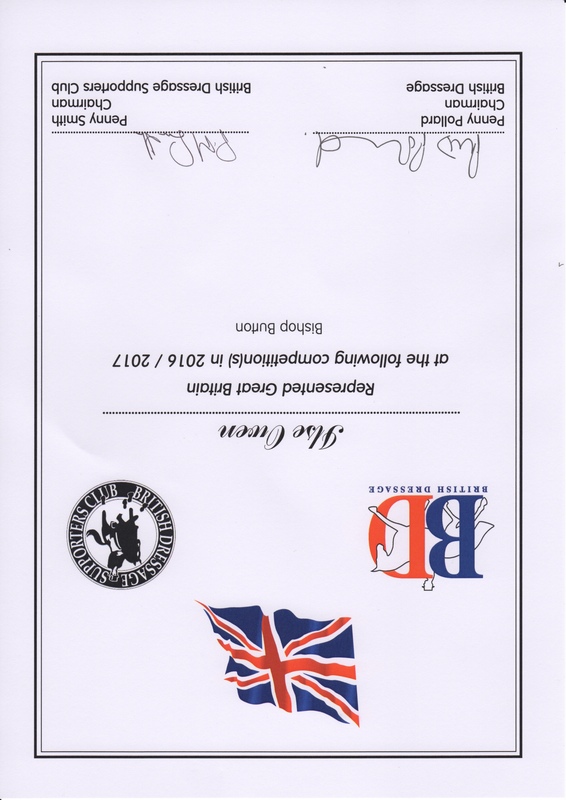 The experience at Bishop Burton was amazing and one I hope to repeat many times, but also receiving my certificate from British Dressage CEO Jason Brautigam in front of everybody in the Supports Club Marque really confirmed that I actually had represented Great Britain. I met Anne Dunham for the first time (she was lovely) and while I was there I also got to see Charlotte DuJardin and Sophie Wells compete in the same class which was pretty special. 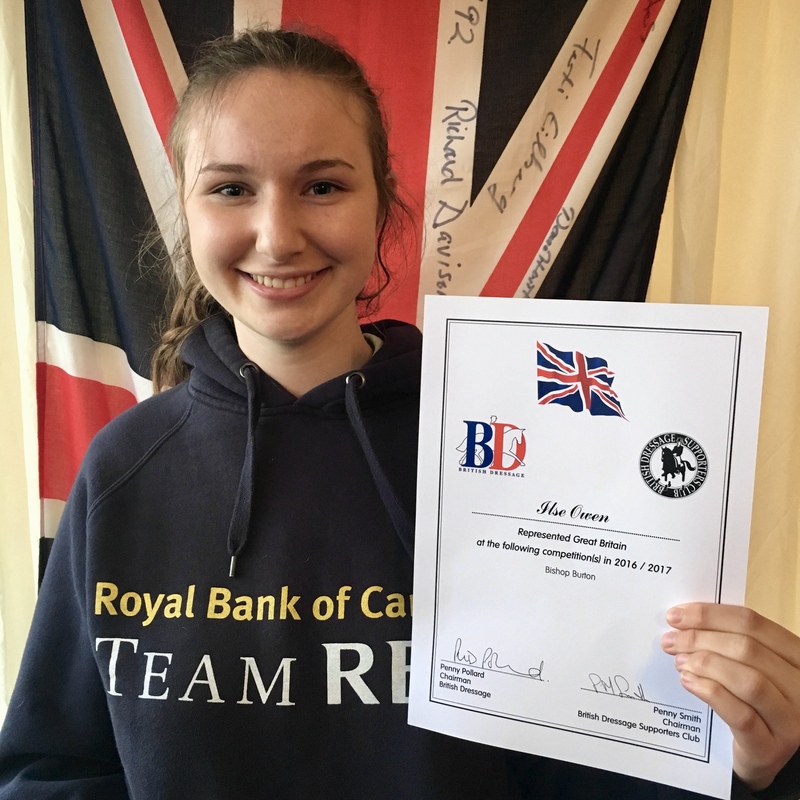 That was amazing, but the really special news of the month was that I received confirmation of my place on the 2017/2019 British Equestrian Federation Excel Talent Development Programme. After being the youngest rider on the last squad I was desperate to get back on as I learned so much in the two years of the programme. I started those two years without my own horse and I finished it this year riding in my first CPEDI 2* International, which is a measure of the progress Aslan and I have made together. It’s also the pathway to World Class selection which opens next year, so it was hugely important to get selected. I had submitted my application in August and received an invitation to ride in a selection trial with Aslan on the 18th September, which we didn’t have to do last time. I was so delighted to get the letter confirming my place a week or so later. Again I was the youngest up for selection and also there were only half as many positions available on the squad this time around, so its even more special to be selected. I can’t wait for the induction and first squad session next month! The next weekend was very exciting as I was invited to a sponsors event at the British Film Institute near Waterloo on the Friday night. The event organised by SportsAid and the Royal Bank of Canada and was to kick off the countdown to the Winter Olympics. 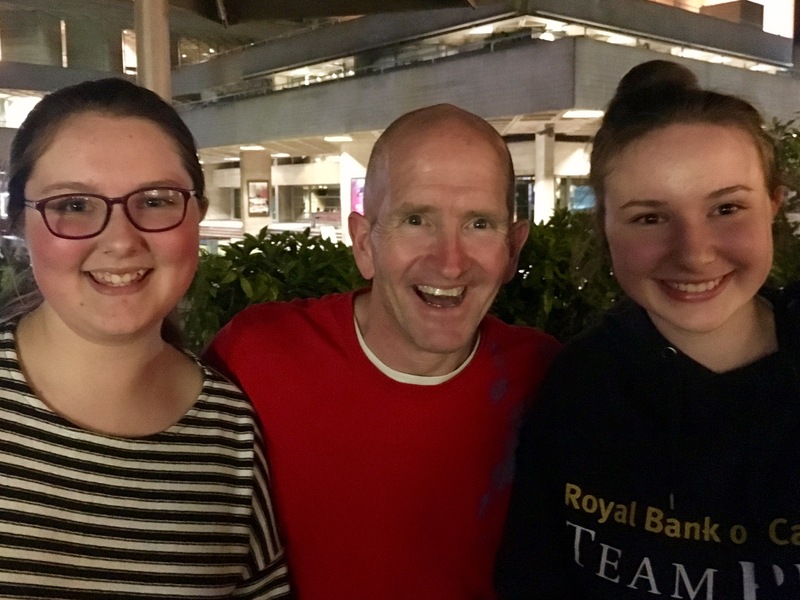 There was a question and answer session with Olympic atheletes Lizzy Yarnold and Annabel Chaffey, followed by popcorn and a screening of the movie Eddie “The Eagle” Edwards, and Eddie was the third person on the panel! It was a great movie and we (my sister Grace and Dad came too) had an amazing evening and I had a long chat with Eddie himself afterwards. He was really nice and very encouraging and genuinely interested in my development. Thank you again SportsAid! And thank you Eddie! So after a late night in London it was up early the next morning to compete at Windmill Farm. 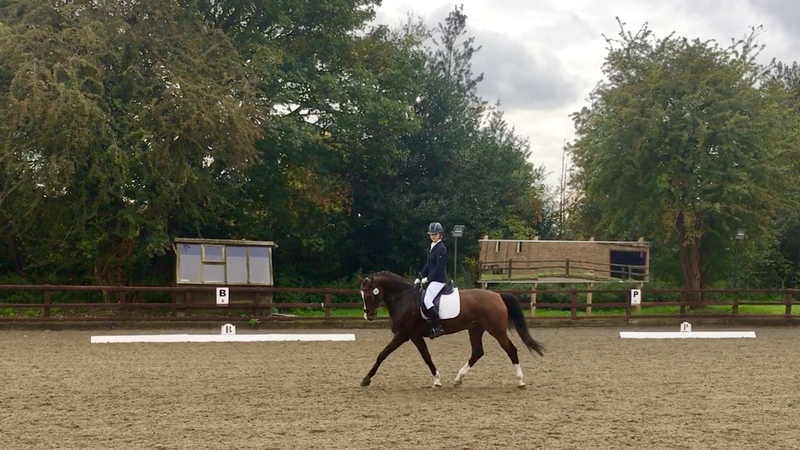 I had my first Novice qualifying points already from the warm up test for the Summer Festival of Para Dressage last month, but this time we had opportunity to add in the Team Test too. Our warm up was a bit stressed as my body was a bit stiff and tired after the late night, which I could tell Aslan could feel, but we both settled down as we entered the arena and we started ok and built some rhythm, but then I had a bit of a twitch as we transitioned to trot after our walk on a long rein which Aslan read as canter, not good! We took a bit of a moment to get back into a decent trot which messed up our next transition to canter. By this time Aslan was truly confused and I don’t blame him! We corrected ourselves and got through the rest of the test without incident, but the Novice scoring is pretty unforgiving out of just 290 points so one big glitch like that and its pretty much damage limitation afterwards. We did still manage 62.7% and gained a couple of qualifying points but I was frustrated and had really wanted much more out of the test, so off we went back to prepare for the Team Test. We only had a few minutes before heading back into the arena, but that was enough to reconnect and refocus. Solihull last month had taught me that if the first test is not great the second can be much better, and it was. We hit a much better rhythm and maintained it. I was still a bit tight but Aslan was working that out and while it wasn’t our best it was an improvement which gave us a score of 65.37% and 4 points towards qualification for the Team, and included our first 8 for Rein Back which was at least something to be satisfied with! It might not have been our finest scores, but this did turn out to be a pretty special occasion, as it was the very first time that I competed in the same event as Sophie Christiansen. 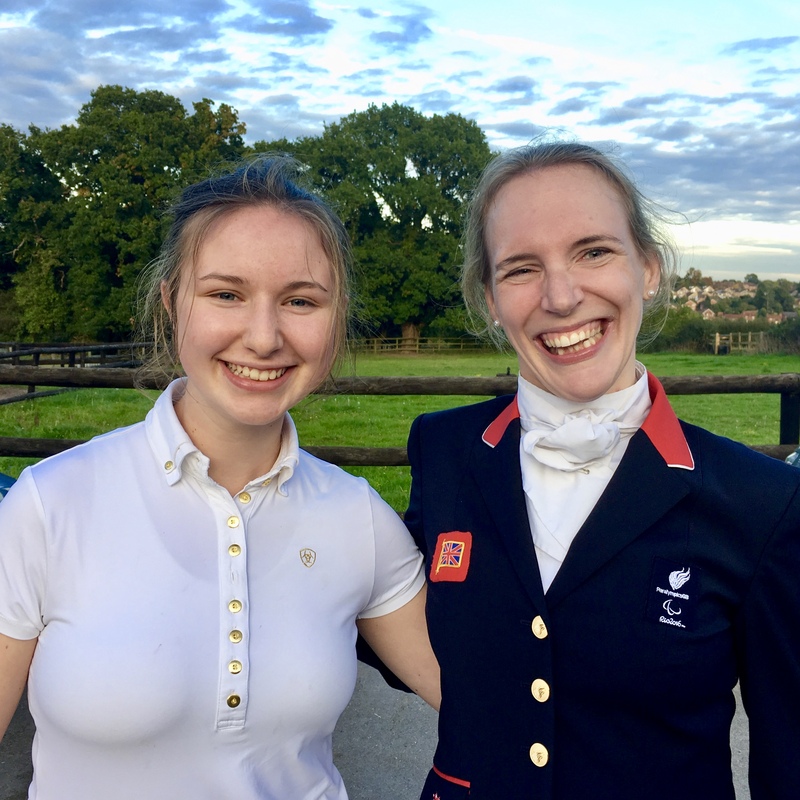 Sophie was my inspiration to get started in para dressage when I was ten and having lessons alongside her as she trained for the London 2012 Paralympics. It was amazing at the time to see her prepare to represent Equestrian Team GBR in London and come home with three gold medals to add to her collection. It was equally lovely and as inspirational as ever to catch up with her, I just wish I could have recorded some better scores for the occasion. To finish off the month I spent a week collecting my training miles for one week to count towards the SportsAid #MyMiles Challenge. SportsAid is a fantastic charity which supports me financially and through numerous opportunities through the year. During the week of 21st September they were asking athletes and supporters to submit their exercise miles and make a donation. I was a bit surprised to find out that Aslan and I cover about 6 miles in each training session, which is pretty impressive given Aslan is doing the whole distance in dressage paces and school movements. Even though I only had two ridden training sessions during the week we still clocked up 22 miles in total, add in at least one other session normally and a competition too and we’d be up around at least 30 in a pretty normal week. SportsAid CEO Tim Lawler put us to shame though clocking up over a hundred training miles in the week. Well done Tim! Here’s some of me and Aslan training during SportsAid Week with Sacha. 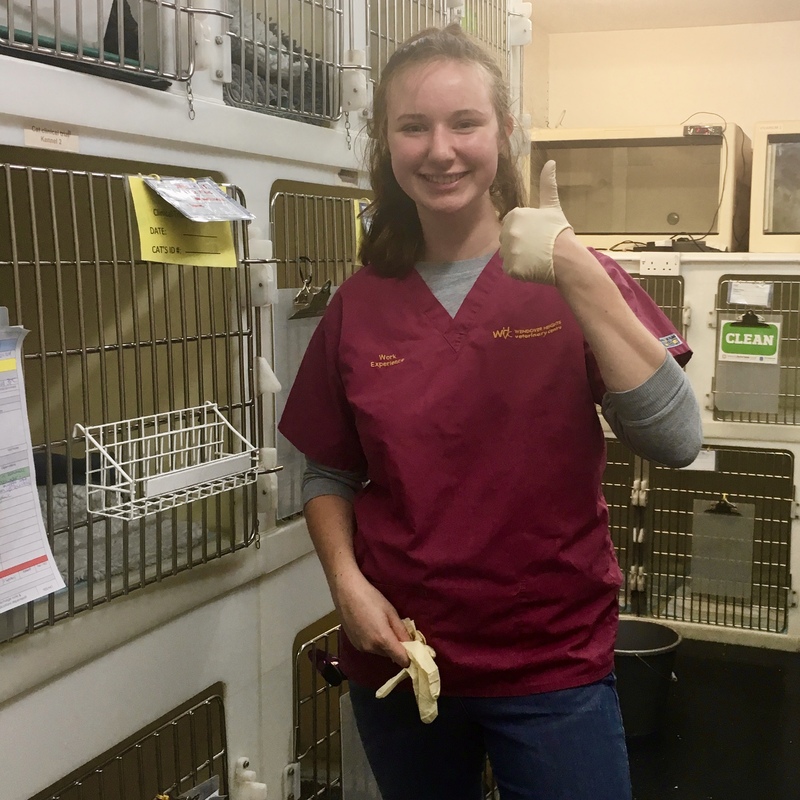 Finally I just wanted to share a picture of me supporting my other passion and ambition, which is to become a vet. For the last six months or so I have been volunteering at Wendover Heights Veterinary Centre on Fridays, which I really enjoy though its a bit of a rush to get there after my personal training sessions at Fitness4Less which are the same afternoon after school in Chesham. It’s a bit of a run around but worth it as I get to see all sorts of animals and get loads of experience. Like I said at the start it’s GCSE year this year as well so I’m going to be working hard to and finding the right balance between everything! Thats it for this month, I hope enjoyed my blog and you’ll come back next month and catch up with what we’ve been up to in October, and in the meantime please do Like @IlseDressage on Facebook to keep in touch with updates during the month.